I'm taking a blogging break for the holiday and beyond. There's just too much going on in my life right now, including work, writing, a family wedding (my niece), moving my son into an apartment, and later in the month, a vacation to Maine and the Atlantic Provinces. Blogging (and reading all of your blogs) is a lot of fun, but something has to give. Have fun! I'll miss you, but I'll be back. Stay healthy! 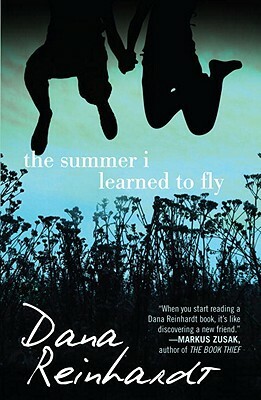 The Summer I Learned to Fly by Dana Reinhardt (Wendy Lamb Books/Random House, July 12, 2011, for ages 12 and up, but I think a mature 10- or 11-year-old could handle it). Source: advanced reading copy from publisher. Synopsis (from the publisher): Drew's a bit of a loner. She has a pet rat, her dead dad's Book of Lists, an encyclopedic knowledge of cheese from working at her mom's cheese shop, and a crush on Nick, the surf bum who works behind the counter. It's the summer before eighth grade and Drew's days seem like business as usual, until one night after closing time, when she meets a strange boy in the alley named Emmett Crane. Who he is, why he's there, where the cut on his cheek came from, and his bottomless knowledge of rats are all mysteries Drew will untangle as they are drawn closer together, and Drew enters into the first true friendship, and adventure, of her life. Why I loved it: If you've been reading this blog for a while, you know that I love quiet books. (If not, see this post about another one.) Dana Reinhardt (How to Build a House, The Things a Brother Knows) is a master of the quiet, thought-provoking book. Don't get me wrong. Plenty of things happen to Drew, the 13-year-old protagonist of this novel, and to the people she loves. There's an accident. There's a long trip in the middle of the night. There's even a leap off a cliff into water. But if you're looking for an action-packed story with sword-fighting and superheroes a la Lightning Thief, you'll have to look elsewhere. The Summer I Learned to Fly makes you think. It's also a lovely summer read because it's all about summer. Drew rides her bike, goes to the beach, helps at her mother's gourmet cheese shop, and admires Nick, the 18-year-old surfer. What draws her to Emmett, who is her own age, is, at first, the mystery of who he is and why he's in the alley. Later, it's the origami cranes he gives her. And later still, it's the quest he's saving up for, a quest to heal someone close to him. Emmett becomes her first real friend and helps her take that leap toward independence, toward learning who she really is. This is a book about friendship, but it's also a beautiful study of adolescence. What summer books can you recommend?